The school books and supplies seem to take over all the space whether you have a school room or use your kitchen table. If you have one child or five, we need to learn how to organize everything. Otherwise, we are going to find ourselves short on patience, frazzled from the chaos and lacking joy in the journey of homeschooling. I don’t know about you but if I was constantly feeling overwhelmed and disorganized, I would probably throw in the towel in this homeschooling thing. God loves things to be done in an orderly fashion. Since we are supposed to be like Him, I think it is important for us to work hard at putting effort into getting our homeschooling supplies organized. It’s so simple and will save your sanity time and again throughout the school year. To implement this you need to purchase a crate that you like as well as hanging file folders. You can make this as simple as you want, such as only having one crate for all of your children combined or having an individual crate per child. I personally prefer the later but most people only have one crate for combining everyone’s school things. I may end up only using one crate as my kids progress into higher grades. The idea is simple, you have one file folder for each week of the school year. You simply remove all of your worksheets and handouts from their package or book and then place them in the corresponding folder for that week. You would also put any crafts you plan on doing or put in reminders for scheduling field trips, etc. You can label the folders with the plastic tabs to make it even easier. At the start of each week, you pull out the needed school work. How does this save you time, energy and your sanity? Because you do all the work up front and then enjoy the fruit of your labor all year round. That sounds like music to my ears, what about you? I think we can attest to having a case of the Mondays and not having any motivation to do anything. When you know that all of your school work is already ready to go, it is much easy to get started with your school day. When you are organized you will have more joy throughout the homeschool year. It’s true! I use this method for my curriculum and I can’t imagine doing it any other way. My preschool and kindergarten years have gone much more smoothly because I invested a few hours up front in organizing for the entire year. Still feeling overwhelmed with the idea of organizing everything? Then I have some good news! The Ultimate Homeschool Organization e-Course is just for you! 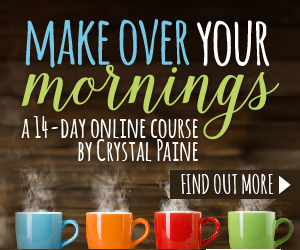 Kristi Clover from Raising Clovers has put together the perfect course to walk you through this whole organization process. She takes the guess work out it for you and walks you through everything! And it’s not just the crate system, she teaches you how to organize everything from your whole school year to time blocking your school days. I just love Kristi and her heart to help homeschool families experience joy in the journey. She has thought of everything in this course, you’ll have video’s to show you how to implement the crate system (and more! ), printables to help you recreate it in your homeschool, how to motivate your kids and how to do it all with little ones running around the house. If you need help getting your homeschool into order, whether you are a veteran or a newbie, Kristi’s course can help you! To see how I make this system work for me check out these posts! Do you struggle with the organization in your homeschool? Do you already use an organization system to help you keep your sanity? Let’s chat in the comments below! If you homeschool you might be interested in my Lesson Planner! Designed for those of us who want simple and cute all in one that won’t break your bank!